If you have been searching for a Hobbit wooden-dollhouse with fireplace we have made it for you! One of the greatest benefits of having a dollhouse is that they give children endless hours of fun. It is not just the acting out scenes that delight children; it is also rearranging the dollhouse furniture in such a way that it pleases their personal tastes and also allows them to create the scenarios they want. As they act out different scenarios, they will create scripts for the different characters in their play. These will help them to understand how people communicate with each other and also about different social situations. 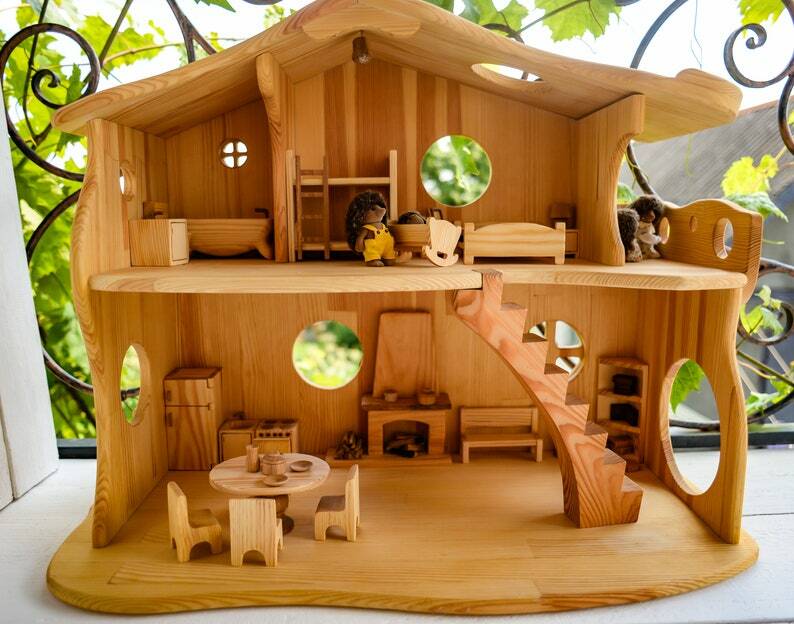 This two-story Wooden dollhouse is 100% handmade, space for several children to play together, and charming details, such as the hand-carved central stairs and fireplace. In the lighted house, the fireplace has a little light in it so it looks like it actually has a fire. It is a great gift for your child, is eco-Friendly, Unique, hand Crafted, safe for children. House lighting of AA batteries. As it works on 4 diodes lamps, it doesn't get hot, safe to touch. Height 55cm/23in, length 70cm/27.5in, depth 35cm/14in. The height of the level (between floor and the ceiling) 25cm/10in, windows 6cm/2.4in. The dollhouse is absolutely gorgeous -- the workmanship is top notch and the design is just beautiful. We had an issue with shipping initially, but the seller could not have been more responsive and helpful -- they made sure everything was corrected. Would definitely recommend.